Until the early 20th century Westhorpe, separated from Southwell by green fields, had a very distinct identity as a working village in its own right. 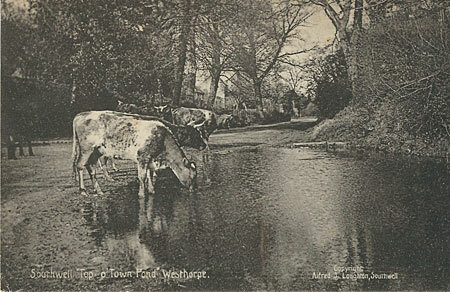 The pond is fed by a spring from the Dumble and the cattle are probably the Pinfold's strayed stock. Opposite, on a slight hill, is the former cottage of the Pinder who looked after the Pinfold, which lies below the cottage. A Pinfold is the place where animals that had strayed would be impounded and could only be reclaimed by the owner on payment of a penalty. Today the pond is known as Top Town Pond, is much smaller and surrounded by a wooden barrier. This postcard was posted on 24 December 1912 to Northampton from Queen Street, Southwell. It wished the addressee "With heartiest good wishes & greetings for a Happy Xmas & a bright New Year". I wonder if it arrived in time for Christmas?